Spend a Night at the Zoo! The Potter Park Zoo Society offers a choice of two overnight zoo experiences for adults and kids to spend a memorable night at the zoo. Camp out beneath the stars surrounded by animal exhibits or enjoy the indoor comforts of our Discovery Center. 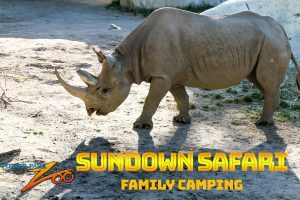 Sundown Safaris are great activities for scouts, 4-H, schools, and youth groups. Scout badge activities can be added for an additional fee. Just as fun as outdoor Sundown Safaris, except that you will spend the night inside the Discovery Center! Scout badge activities can be added for an additional materials fee. Each camper will need to bring their own sleeping gear, including tent if sleeping outdoors, sleeping bag, pillows, toiletries, bug spray, flashlight, rain gear, etc. (no trailer campers or motor homes are allowed) Children must be accompanied by an adult at all times, and it is not recommended that children under four years of age attend the overnight. In case of severe weather, campers will be moved indoors. To make a reservation, email or call us at (517) 342-2713.